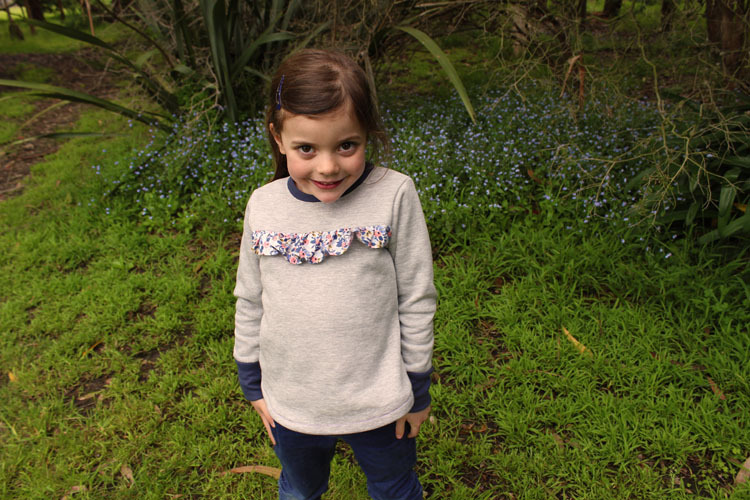 This week my lovely testers are sewing up the Issie top. It's a very exciting part of the process, seeing my designs being sewn up by talented sewists from around the world! Things are going well and the pattern will ready for release next Tuesday 17th October. I changed the sizing on the pattern which meant that an extra size has been added. So the Issie top will be sized from 12 months - 12 years! Yay. 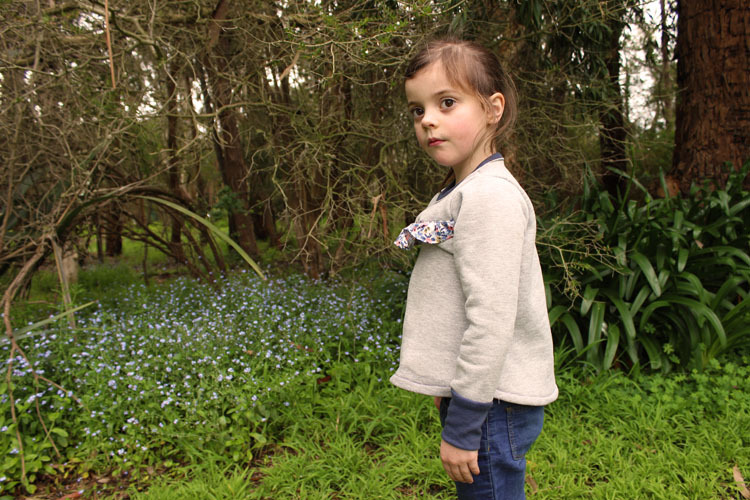 I needed to sew up a couple of samples to test the new sizing so I whipped up this grey Issie top today for Emily from fabrics I had in my stash. I love that woven fabrics can be used for the ruffles on this top, which means my scrap bags can be put to good use! 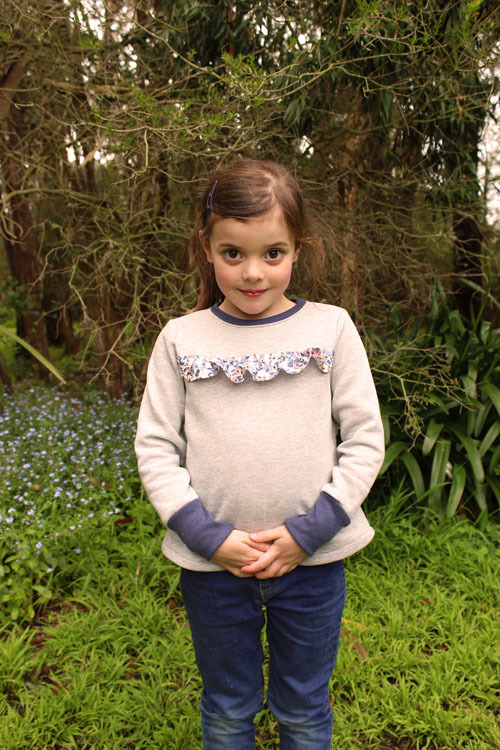 For this top I used a grey sweatshirt fleece I have had forever, some dusty navy ribbing and a scrap of Les Fleurs fabric by Rifle Paper Co leftover from Emily's birthday dress (which she has since grown out of!). 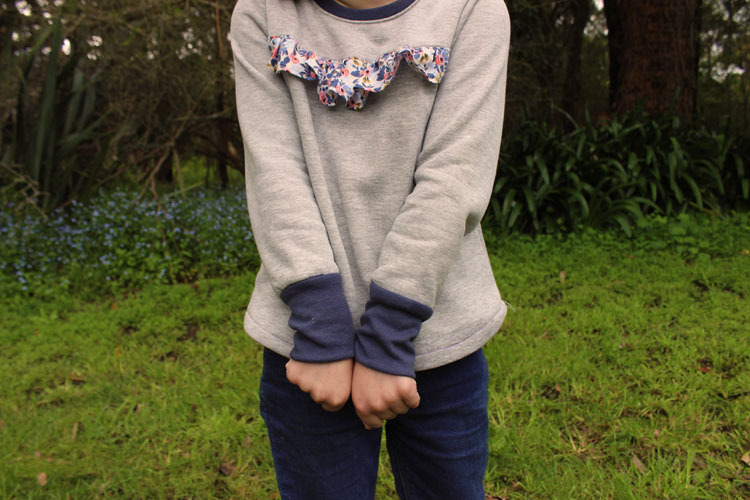 I chose the undivided top option with the slightly flared sides, cuffs and single ruffle. This really is such a quick sew with the undivided option. The hemline is slightly scooped and the cuffs can be left off for a three quarter sleeve. 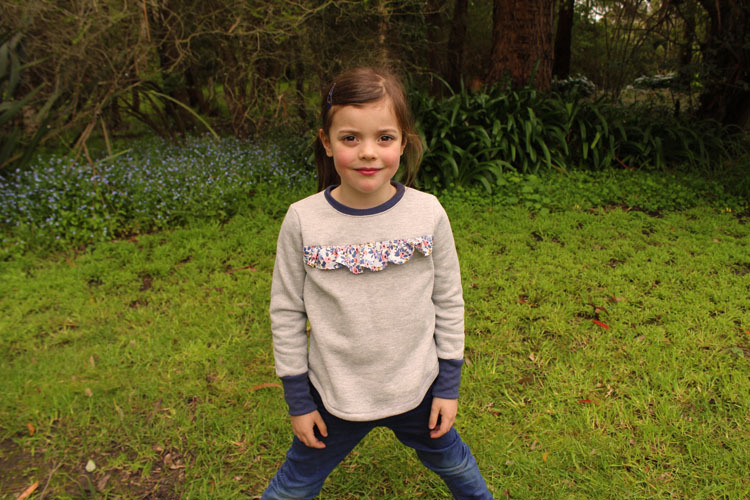 I am suddenly looking through my stretch fabrics stash looking for more pieces of fabric I can turn in to more Issie tops because my girls just love wearing this style of garment. Emily says, "Can I wear this to kinder next week? I look so grown up with my hair like this!" She can't wait to go to school next year to be with her big sisters! This top took me around 45 minutes to make and another 45 minutes for Emily to christen it with chocolate cake tonight to celebrate her Grandma's return from overseas! Thanks Isa! Look forward to seeing yours! This is a lovely top Suz. Why do kids are in such a hurry to grow up!